The Dell Power Companion (12,000 mAh) USB-C lets you bring extra power with you, so you can be more productive. This handy device powers select Dell Notebooks and Ultrabooks via your notebookâ€™s USB-C port, as well as up to two smartphones, tablets or other USB-enabled devices. The Dell Power Companion is lightweight and compact, so you can stay powered on-the-go without adding bulk to your bag. This compact power solution fits seamlessly into your mobile lifestyle by fitting neatly into your laptop case or bag. The Dell Power Companion (12,000 mAh) USB-C is designed to deliver in-bag charging, so your devices are charged when you need them. Itâ€™s also specifically designed to fit into the Dell Premier Backpack and Dell Premier Briefcases. The USB ports on the Dell Power Companion (12,000 mAh) USB-C allow you to simultaneously charge up to two mobile devices, in addition to your Dell notebook. The compact and convenient Dell Power Companion features an 12,000 mAh six-cell battery that provides reliable power when youâ€™re on the go and is easily charged using your Dell power adapter. 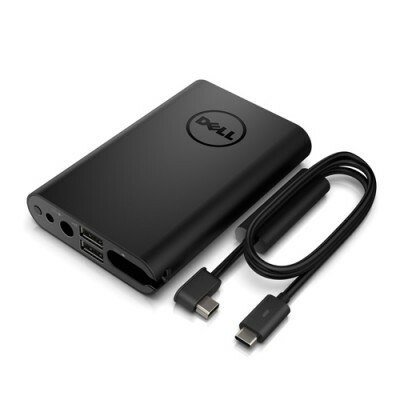 The The Dell Power Companion (12,000 mAh) USB-C can be charged and powered by 4.5mm, 7.4mm or USB-C Dell power adapters. A five-segment LED clearly displays how much power is left, so you can plan accordingly. The Dell Power Companion (12,000 mAh) USB-C lets you bring extra power with you, so you can be more productive. This handy device powers select Dell Notebooks and Ultrabooks via your notebookâ€™s USB-C port, as well as up to two smartphones, tablets or other USB-enabled devices. The Dell Power Companion is lightweight and compact, so you can stay powered on-the-go without adding bulk to your bag. This compact power solution fits seamlessly into your mobile lifestyle by fitting neatly into your laptop case or bag. The Dell Power Companion (12,000 mAh) USB-C is designed to deliver in-bag charging, so your devices are charged when you need them. It's also specifically designed to fit into the Dell Premier Backpack and Dell Premier Briefcases. The Dell Power Companion (12,000 mAh) USB-C helps keep all your mobile devices charged and ready to go, including smartphones, tablets and more. Two USB charging ports let you simultaneously charge a pair of mobile devices in addition to your Dell notebook.